The Hotchkiss gun can refer to different products of the Hotchkiss arms company starting in the late 19th century. It usually refers to the 1.65-inch (42 mm) light mountain gun; there were also a navy (47 mm) and a 3-inch (76 mm) Hotchkiss guns. The 42 mm gun was intended to be mounted on a light carriage or packed on two mules to accompany a troop of cavalry or an army travelling in rough country. The 1.65-inch (42 mm) gun and accessories could be packed on two mules. 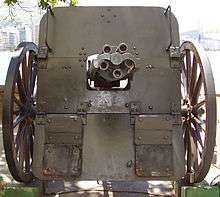 The gun was introduced as a modern replacement for the aging twelve-pound mountain howitzer. The first gun purchased by the U.S. military from the French arms firm of Hotchkiss was employed against the Nez Percé in 1877. Over the next twenty years the U.S. purchased 56. They were used at the Wounded Knee Massacre in 1890, and again in Cuba for the attack on San Juan Hill and in the Spanish–American War. The term "Hotchkiss gun" also refers to the Hotchkiss Revolving Cannon, a Gatling-type revolving barrel machine gun invented in 1872 by Benjamin B. Hotchkiss (1826–1885), founder of Hotchkiss et Cie. It was a built-up, rifled, rapid-fire gun of oil-tempered steel, having a rectangular breechblock which moved in a mortise cut completely through the jacket. It was designed to be light enough to travel with cavalry, and had an effective range beyond that of rifled small-arms. 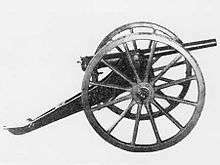 The 1-pounder revolving Hotchkiss cannon had five 37 mm barrels, and was capable of firing 68 rounds per minute with an accuracy range of 2,000 yards (1,800 m). Each feed magazine held ten rounds and weighed approximately 18 pounds (8 kg). 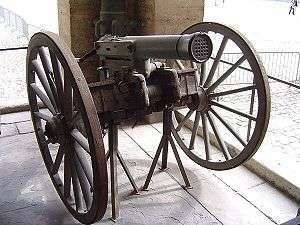 Besides the field gun version, several other versions of the 37mm Hotchkiss revolving cannon were in existence, notably versions for naval defense against torpedo boats as well as fortress versions firing shrapnel or canister for the defense of moats. The naval version was adopted by Russia and the United States, amongst others. 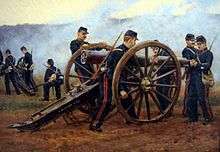 The field cannon version was accompanied by a horse-drawn ammunition limber, which held 110 rounds plus six loaded magazines, totaling 170 rounds. One example is on display at the Museum of the History of the Brazilian Army at Fort Copacabana, Rio de Janeiro. A 3-pounder 47mm Hotchkiss revolver cannon was also adopted by the US and Russian navies in the 1880s. This had five barrels. With 3-pounder and 1-pounder weapons, it is difficult to determine from references what type of weapons a particular ship had. Single-shot, revolver cannon, and (from 1890) Maxim-Nordenfelt 1-pounder machine gun weapons were all used on new warships 1880-1910. All of these were called quick-firing or, in the US, rapid-firing. Hotchkiss also produced a range of light naval guns and, in the 1930s, anti-tank guns. The naval guns which originated in the 1880s were mostly 3 pounders and 6 pounders and originally were widely used (by Britain, Russia, and the United States amongst others) for close-up defence of major warships against small craft armed with the newly invented locomotive torpedo. When improvements in torpedo range made them obsolete in this role, they continued to be used as small-craft armament up to and including World War II. In World War I the British motor gunboats which won naval supremacy from the Germans on Lake Tanganyika were armed with the Hotchkiss 3 pounder. The Hotchkiss 6 pounder was adopted by the British army for the first tanks. During World War II the 6 pounder was the main weapon of the early units of the numerous and successful Fairmile 'D' Class motor gunboats of the Royal Navy, not being entirely replaced by more modern weapons until 1945. Wikimedia Commons has media related to Hotchkiss 47 mm Revolving Cannon. Wikimedia Commons has media related to QF 3 pounder Hotchkiss.